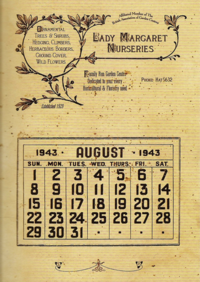 A calendar for August of 1943, in the abandoned Riddle House in the 1990s. 1940: Rubeus Hagrid starts at Hogwarts. 1940 to 1945: Grindelwald's Revolution. 1943: Tom Riddle opens the Chamber of Secrets. Several students get injured, Moaning Myrtle gets killed by the Basilisk. Hagrid is framed for the attacks by Riddle and is expelled. Summer, 1943: Tom Riddle murders his father, Tom Riddle Sr., and his grandparents, Thomas and Mary Riddle, for the abandoning of his late mother, Merope Gaunt. His uncle, Morfin Gaunt is framed for the attacks by Riddle and is sent to Azkaban. 1944: Margot Droope receives an award for unkown reasons. 1945: Tom Riddle graduates from Hogwarts School of Witchcraft and Wizardry. 1945: Albus Dumbledore defeats Gellert Grindelwald, who is sentenced to life in Nurmengard. 1 September, 1946: Minerva McGonagall starts attending Hogwarts School of Witchcraft and Wizardry, and proves to be a Hatstall during her Sorting. 1946: The seventy-eighth Wizarding Schools Potions Championship is held. 1947: The Werewolf Register is introduced. 1947: A History of Magic by Bathilda Bagshot is first published. A fanged gerbil was found to have been put into Augusta Longbottom's handbag as a joke by her husband. 1948: Wilhelmina Tuft becomes Minister for Magic. 1949: A hippocampus is caught by Merpeople off the coast of Scotland. 1940 to 1944: Winky Crockett captained the Slytherin Quidditch team. 1944 to 1948: Neil Lament captained the Slytherin Quidditch team. 1948: Andrew Snowyowl captained the Slytherin Quidditch team from 1948 until the end of the decade. Summer, 1943: Tom Riddle Sr.
1942: Mike Newell, director of the film adaptation of Harry Potter and the Goblet of Fire, was born on 28 March. 1942: Gemma Jones, who plays Hogwarts' Nurse Poppy Pomfrey, was born on 4 December. 1945: Andrew Burt, a British actor who provided voices in the video game adaptation of Harry Potter and the Deathly Hallows: Part 1, was born on 23 May. 1946: Alan Rickman, the actor who portrays Severus Snape, was born on 21 February. According to the mini-adventure The Queen's Handbag, Augusta Longbottom, grandmother of Neville Longbottom, was the victim of a prank by her husband involving her handbag and a fanged gerbil in 1947, leading her to booby-trap her handbags from then on (leading to some pain for Ron Weasley). The Queen's Handbag breaks from canon in several places (not least of which by being set in 2006), so therefore whether anything included in the adventure actually counts as continuity is a matter of debate. This piece of information regarding Longbottom is listed here, however, as the only piece of new Potter Universe backstory offered in the mini-adventure. This page was last edited on 28 July 2015, at 11:30. This text is available under the GNU FDL and may have been adapted from the Wikipedia article about 1940s (history).